This is Phyl’s Popsicle Sticks quilt, the third one I have quilted for her so you know this is one of her favorite patterns for using Bali Pops. I quilted it with the panto Curlz and used Dream Blend batting. She asked me to dye a backing for it and I knew that it had to be a soft teal as the top reminds me of the color of the ocean and sand. I was so happy with the results as dyeing a large backing a very light color can be tricky. The color came out even across the whole back with a subtle texture from the crumple in the dye bath. I’m slowly learning how to use the manual setting on my camera and want to stop relying on my automatic setting. I had to delete a lot of ‘whoops’ pictures today but that is part of the learning curve. The first thing I want to show you is my new frames. I am now using Q-snap frames (used for x-stitch or hand appliqué) instead of my wood frames. I have retired my small wood frames for two reason. First the Q-snaps are easier to clean and I can take off the nylon mesh and give them a good wash. The second was when I laid the wet fabric on the wood frames I would get bleeding from the colors on the wood onto the wet fabric if the fabric touched the wood…which it always does. So I’m very happy with this new system and now have my eyes out for more Q-snap frames in clearance sections when I’m in any hobby shop. So now that I’ve shared my new frames here is a reminder how I crumple up my fabric before laying the snow on. Remember the fabric has been pre-soaked in a Soda Ash solution. Now to the fun part, mixing the dye powder into the snow. I used 4 litre ice cream pails and filled them about 3/4 full with snow. I added about 1 to 2 tsp of dye into each pail. Stir the snow and dye powder well! Now scoop your colors onto the fabric as high as you can and try not to mix the colours too much. They will blend as the snow melts. For the first fabric I used Fuchsia, Cerulean Blue and Raspberry and for the second I used Bright Yellow, Orange and Fuchsia. This is Raye’s quilt and the pattern is from one of the Turning Twenty books, I believe it is from Turning Twenty...Again. She used Bound to the Prairie fabrics by Kansas Troubles. I didn’t have to ask her about the fabrics as I made a quilt with the same fabrics about 6 years ago. Raye asked for a loftier batting so I used Dream Puff and the panto is called Wildflower by Jodi Beamish. I love the simple flower design on this panto as it really compliments the tiny flowers in the fabric collection. You can see the quilting very nicely on the backing fabric which has a tiny floral design as well. This is John’s second quilt that he sent to me this month and he asked for light custom quilting. 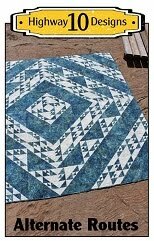 The pattern is called Minnesota Homewarming by Pat Speth and it can be found in the Quiltmaker magazine March/April issue 2012. This quilt is mostly borders without a true break between them so that made it a bit of a challenge coming up with quilting designs. I decided to use feathers, swirls and cc’s as the main elements for the quilting motifs and not use a background fill as the background fabrics are very isolated. Most of the designs are free hand and used my Boomerang ruler for the large CC’s in the center motifs in the quilt. I used Quilter’s Dream Cotton Deluxe batting and So Fine off white thread. It’s cloudy out today and the snow should start falling at anytime but I was able to get a few pictures out on the ice. You can’t see the quilting but the colors really pop with the ice as the background. Here is a picture of the backing, a fun bright batik print. The ice is nicely polished by the wind right now and crystal clear. I could actually see the bottom of the ice and it is deeper than I thoughts…must be closer to 4 feet thick now. The large cracks do not go all the way down so it is hard to see in the photos. This picture reminds me of a lightening bolt! Those fine wispy cracks at the surface at the ones that I have seen/heard form when I’ve walked on the ice when shovelling. 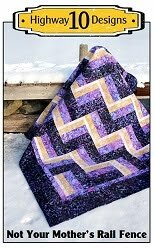 This is John’s Love Letter’s quilt and is a Block of the Month pattern by This and That Patterns. This quilt has a very romantic, traditional feel and was pieced beautifully. John requested Quilters Dream Cotton Deluxe batting and we decided on using Double Plume for the panto. This panto added wonderful texture to the quilt top and once it is washed the cotton batting will give it a real heirloom look. You might have noticed that my patch of ice is shrinking! The weight of the snow banks around it have been acting like insulation and creating slush under the snow and it is slowly creeping onto the rink. It is very common to walk out on the lake in the deep snow and encounter slush as the snow acts like a quilt on top of the ice. The only reason my patch of ice is so clear is that I have keep it exposed to the cold air. I’m hoping my little window into the lake last another month. It was very windy out yesterday when I took these pictures…and my still-life photography turned into an action shot! It actually flew right up and I caught it!! Well after keeping up with the 12 months of instructions I can’t believe I stuck with it and finished the Just Takes Two Mystery Project. I had a love/hate relationship with this project all year long but I’m glad Lori kept encouraging me to keep going. 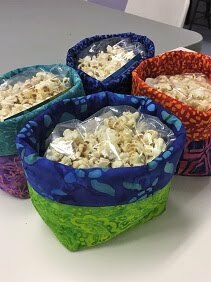 It was the perfect project to use up my hand dyed samples and I focused mainly on my fabrics with bold and bright colours. It’s definitely a bright quilt and not my usual style but that's what I love about quilting, trying new thing!! Its a good size quilt at about 74” x 96” and I added a 2 1/2” white border to secure all the blocks around the outer edge . They gave a few border options but I didn't think it needed any more piecing. My favorite block in the whole quilt is the light blue feathers star, I love that block. 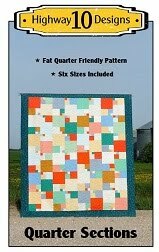 This is Marg’s Perfect Ten quilt that she made with an assortment of Asian print fabrics. I like how she used black as the focus fabrics in the frames and border. The panto is called Fantasia by Hermione Agee, the batting is Quilter’s Dream Puff and the thread a green So Fine. 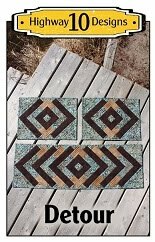 The backing was a beautiful greenish brown Stonehenge that matched the top fabrics perfectly. Another cold day up north and here is a view looking towards my neighbours cottage on the south side of our place. I’m happy to report that all three winner of my Infinity Scarves have sent me their mailing addresses so I’ll be getting those in the mail to them on Monday. Congratulations to Carole, Lori and Laura!! I’ll be sending you emails to get your mailing addresses. I would like to thank everyone that left comments on my Giveaway post and for sharing your coldest temperature stories, I enjoyed them all! Tomorrow our guild is having our first UFO day where we bring our sewing machines and work on our own projects from 9am to 5pm. 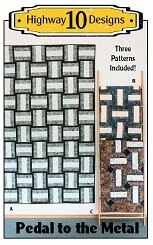 I plan on putting my Just Takes Two block together and after seeing Lori’s quilt top on her blog I’m very excited to get mine done. You can see Lori’s quilt top here.